My Last Chase Card Application Ever? A few nights ago I had an AOR (app-o-rama) and applied for 3 cards, including the Marriott Rewards Premier from Chase. Unless something changes in Chase’s 5/24 policy, this may be my final Chase application for the rest of my credit card career. As I discussed in this post, the policy says that if you have 5 or more new card applications (from any card issuer – not just with Chase) in the past 24 months, you will be summarily denied on any Chase application. I have opened 9 new credit cards in the past 24 months, so I’m well beyond the 5/24 limit. 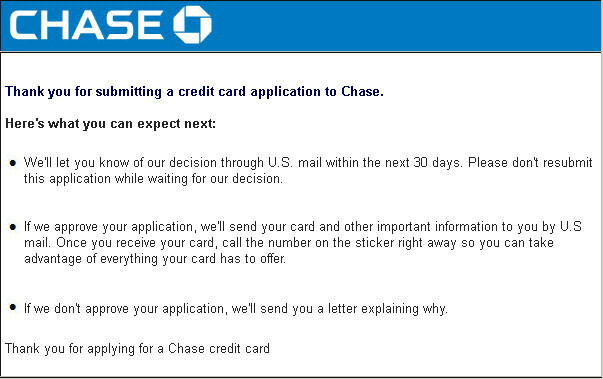 But the rule goes into effect for Chase co-branded cards some time this month (April), and I applied for the Marriott card on March 31st. I didn’t particularly want this card but I figured it was my last chance to get any Chase card for the foreseeable future, so I picked the best current promotion that I was eligible for and gave it a shot. The Chase Marriott Rewards Premier card: 80,000 Marriott Rewards points (+7,500 for adding an authorized user) after spending $3k in 3 months. $85 annual fee not waived the first year. The Spark Cash for Business from Capital One (gasp! ): $400 cash back (+$90 for meeting the spend) after spending $4.5k in three months. Annual fee waived the first year. The Hilton HHonors card from American Express: 75,000 Hilton points after spending $1k in 3 months. No annual fee. This entry was posted in American Express, Capital One, Chase, Credit Cards, My Story and tagged Hilton HHonors, Marriot Rewards, Starwood Preferred Guest on April 7, 2016 by Gomanson.